A vintage Kenner Tie-fighter with a seized-up motor needs more than a gentle spin to get it started. In this thread from The Imperial Commissary, collectors share their tips on getting the electronics of vintage toys running again without causing damage. X-Wing sound and light/electronics fix? With growing interest in collecting prototype toys, many vintage Star Wars toy collectors have ventured into collecting prototype pieces from modern Star Wars toy lines. In this thread from The Empire Strikes Back group, collectors define modern prototype collecting and discuss the merits of modern prototypes, while limelighting some special pieces. Are modern (POTF2 and beyond) Prototypes the next big thing in the hobby? 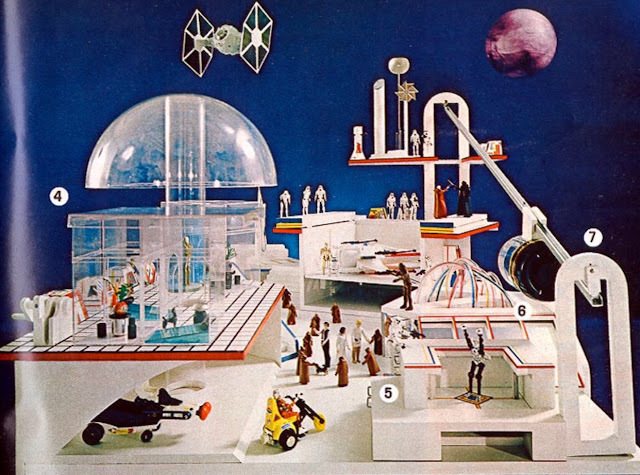 Between May 1978 through November 1980, Woman’s Day magazine, a monthly American publication, designed blueprints for 3 highly detailed Star Wars playset environments to be used with Kenner action figures. The sets included an Outer-Space station, a Dagobah playset, and a Hoth playset. Complete Outer-Space station blueprints could be directly ordered through the magazine for one dollar. In this thread from The Imperial Commissary, a collector rediscovers the Woman’s Day playsets and their unique charm. How Many UDEs are There? In 1985, with the finale of the Original Trilogy now two years in the rear view mirror and with no new chapters scheduled for release, the Star Wars franchise was about to enter its first hibernation. The Kenner toy company had rose from obscurity in the late 1970s due to their unprecedented success with their lines of Star Wars toys which sold in the hundreds of millions. But by the mid 1980s after the release of more than 100 unique figures, the demand for the toys was gone. The last wave of Kenner Star Wars action figures were designed as a second wave of figures for the failing Star Wars Nelvana Droids and Ewoks cartoons. 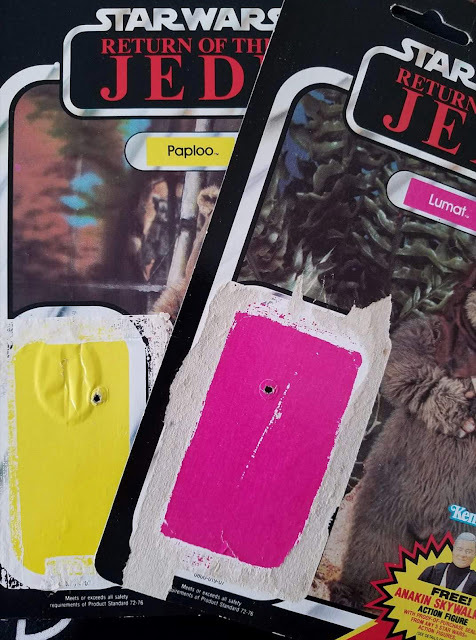 Six additional Ewoks-based figures and 8 Droids-based figures were designed, sculpted and developed to the point of injection molded plastic first shots before the line was canceled. 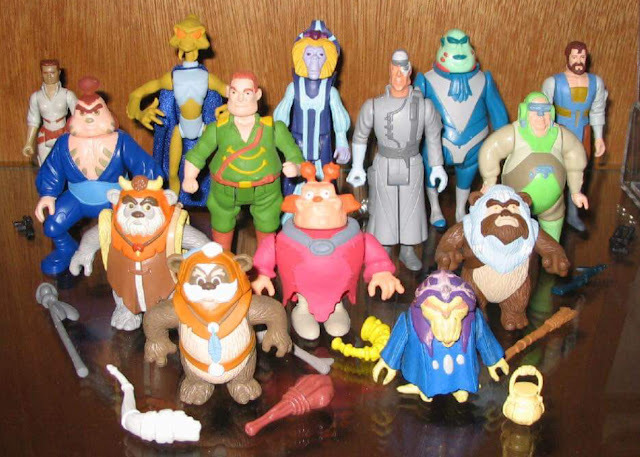 None of these 14 figures made it to market except for the infamous Vlix figure, which enjoyed a very limited release in Brazil under the Kenner sub-licensee Glasslite. The few surviving prototype figures for the second wave of unproduced Droids and Ewoks ("UDE") figures are among the most coveted in the Star Wars action figure line. Insights into the production numbers of UDE figures and their multiple accessories are discussed by fellow collectors in this thread from the Prototype Exchange. 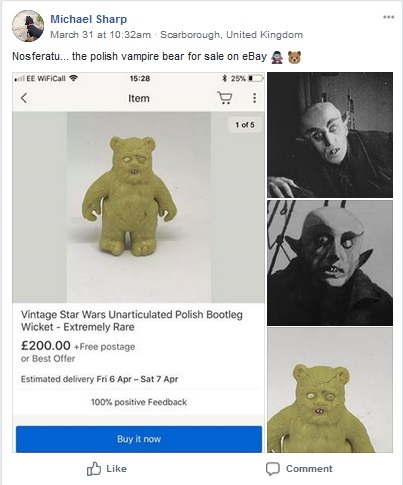 In this thread from The Dark Times group, a collector is offered a pre-production wax piece by the original sculptor and after studying the details, finds the piece may have been altered or cast at a later date. 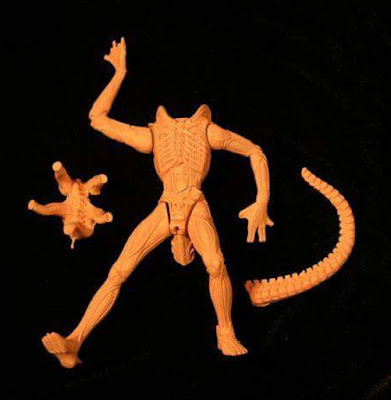 While the piece is from Kenner's Aliens line, the sculptor in question also worked on the vintage Star Wars line and has allegedly engaged in this kind of dubious behavior with Star Wars pieces in the past. There’s a Hole in My Cardback! 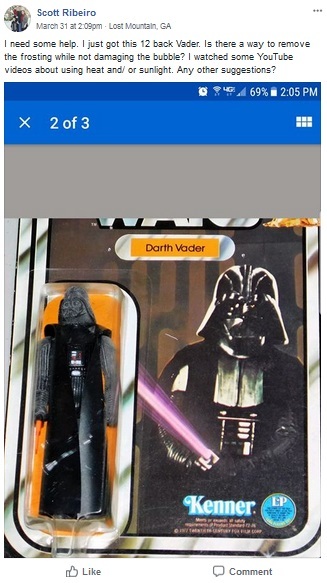 Carded action figures produced in Mexico in the Return of the Jedi era will usually have a crudely punched hole in their cardbacks behind the figure. Collectors discuss this odd feature on The Imperial Commissary Paper Group. Every now and again you see something which reminds you of just how vast the world of pre-production stuff is. Literally every single thing you can buy has any number of stages before you're able to purchase it in stores. 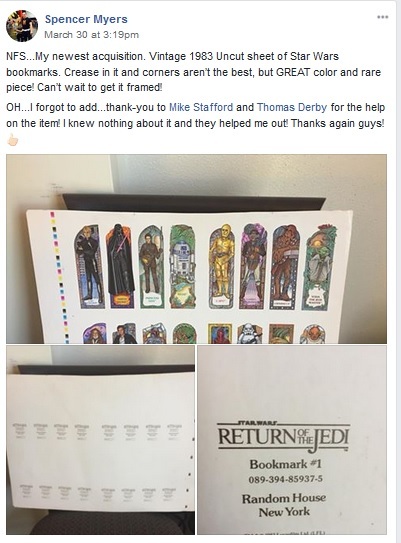 And in this thread, a collector showcases one of the cooler examples of that: an uncut sheet of the vintage bookmarks released by Random House! 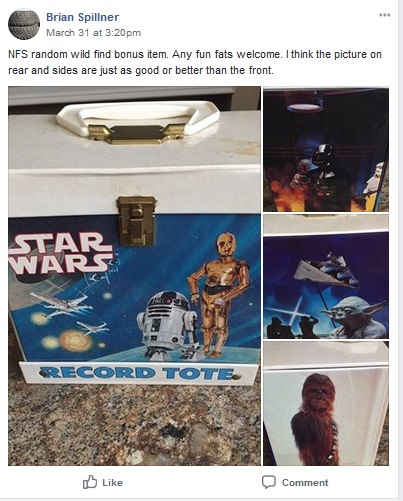 In this thread, a collector finds an interesting carrying case for 45rpm records, which leads into a discussion of this early collaboration between Star Wars and Disney. The nature of collectibles is that they are not eternal. We are interested in their condition because we like to see them as pristine as possible. We encase them in acrylic because we like to imagine that we can keep them from ever changing. 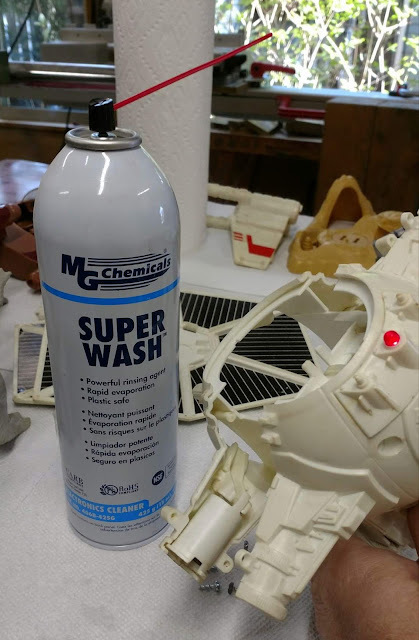 Unfortunately, Star Wars toys are, in actuality, merely solidified clumps of garishly painted chemicals, constantly going through unseen processes. The plastic bubbles are yellowing, the cardback seals are failing, and the plastic figures themselves are deteriorating. They will almost certainly outlast us all, but they are not eternal. As such, it falls on the individual collector to watch for signs of this processes and to help preserve the toy for as long as possible. 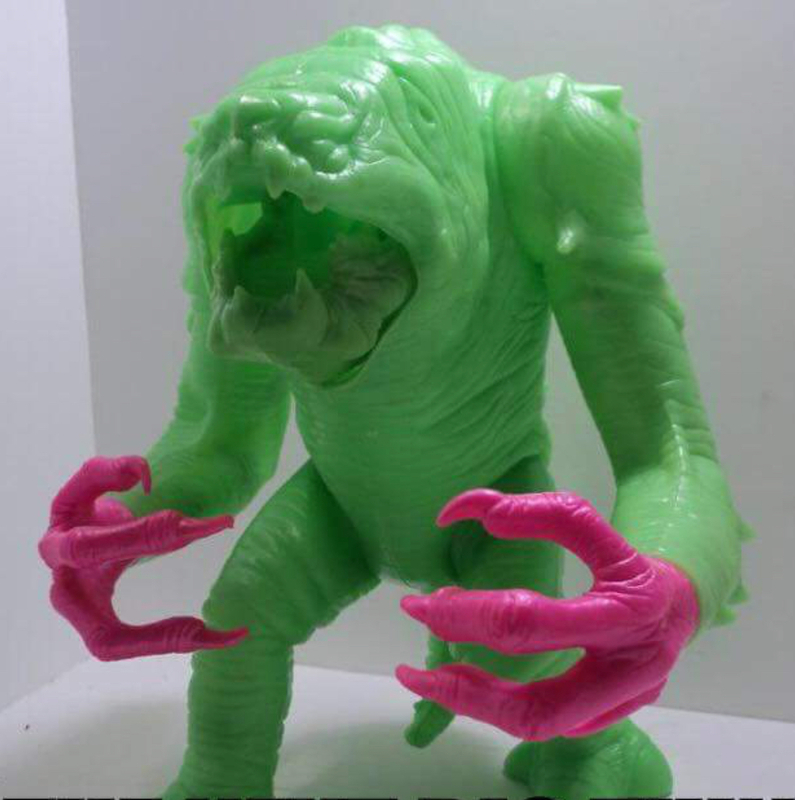 In this thread, a collector tries to remove the effects of plastic degradation (which collectors refer to as "frosting") from a carded figure, and asks the community for help. Any collectors concerned about long-term collection plastic degradation? Has anyone successfully "de-frosted" an AFA encased MOC figure? Frosting, and I'm not talking about the delicious kind. . .
white crystal stuff that seems to show up on some limbs. Frost on MOC Figures - Does it Return??? For our money, there is no vintage Star Wars collectible quite as terrifying as the line of bootleg Ewoks released in Poland. They have scary zombie eyes, rodent fangs, and the coloring of a 1940s sci-fi monster. In this thread from the Jawa's Outpost Group collectors discuss these horrid little guys, and try to figure out what they most resemble. As regular readers of the Star Wars Community Digest probably know already, 1982 had no real idea what was going on in Return of the Jedi. In previous issues, we've seen them debate whether or not Vader is Luke's mother, whether it's "Clone Wars" or "Colon Wars," and just what would happen in ROTJ at all. In this week's installment of the soap opera which was 1980s Star Wars fandom, we will introduce a new complication: Is Return of the Jedi a sequel to ESB? Or does it in fact take place before ANH? The crux of this debate seems to be pre-release images of Obi-Wan, which were shown or leaked somewhere. The fandom noticed that Obi-Wan appeared corporeal (a word you don't get to use often in SW fandom), rather than as a Force ghost. They deduced that Obi-Wan must have somehow returned from the dead (a Jedi Master appearing across the galaxy as an apparent corporeal warrior, when he is in fact just a spirit? That is the STUPIDEST idea for a Star Wars movie I've ever heard. No fan would accept something so asinine). Unhappy with that explanation, some in the fandom speculated that the then-titled Revenge of the Jedi was in fact a prequel to ANH, rather than a sequel to ESB. Thanks for another great edition, guys. I love this feature.